Warriors games might not be to everyone’s liking, but here at Miketendo64, we love them all. From Hyrule Warriors to Fire Emblem Warriors and Samurai Warriors, as long as they’re on a Nintendo platform, we just can’t get enough of them and our latest obsession is Warriors Orochi 4! In typical interview fashion, would you be so kind as to introduce yourself to our readers, tell us a bit about your history and just what it is your involvement with Warriors Orochi 4? Masaki Furusawa: My name is Masaki Furusawa and I am the producer of “Warriors Orochi 4”. This is my first time working on the Orochi series, but I have been working for a long time on the Warriors series as a member of ω-Force. Recently I have been taking on the challenge of bringing a new Warriors experience to players with my work as producer of “Warriors All-Stars” and director of “Hyrule Warriors”. Miketendo64: For our readers who have never played a single Warriors Orochi game, how does this series of Warriors games compare to your other offerings and what is the story this time around? Masaki Furusawa: The Orochi series is a cross-over of two long-lasting series of ours: “DYNASTY WARRIORS” and “SAMURAI WARRIORS”, in which characters of both series meet with each other in the context of an original story. In this new title, gods and goddesses also appear in the story. Miketendo64: For the gamers who have never played a single Warriors Orochi game, can they dive right into Warriors Orochi 4 or is it a necessity they have played all previous titles? Masaki Furusawa: There is no problem at all starting the series with this title. The story of this title is new from the previous titles and there is no need to master difficult controls. Also, players can view summaries of previous stories as complementary information. Miketendo64: If I had to pick just one thing that impresses me the most about Warriors Orochi 4, it’s got to be fact that the game offers 170 playable characters. That’s not just amazing, but downright incredible. What prompted the decision to include so many characters and how have you found act of trying to bring them all together in a single game? Masaki Furusawa: This number of characters was not an objective in itself, it is just that by adding characters from base games “DYNASTY WARRIORS 8” and “SAMURAI WARRIORS 4”, Orochi original characters, and finally this title’s new characters, we ended up reaching a total number of 170 characters. Of course, there are characters more popular than others, but as there are fans that love even the least popular ones, we prioritized featuring each character in this title. Miketendo64: Although Nintendo are not involved with Warriors Orochi 4, given the impressive line-up of Samurai Warriors and Dynasty Warriors characters, did you ever consider asking Nintendo if a character or two from Hyrule and Fire Emblem Warriors could be included? Masaki Furusawa: Yes, we thought about it. However, as we focused on delving deeply into the DW and SW cast, including an “incomplete” cast of these other games would be disrespectful towards the fans, so we decided not to do so. Miketendo64: Being as though the game does feature 170 characters and a story that borders on epic proportions, as a multi-platform title, are any sacrifices having to be made for the Nintendo Switch version? How does it compare to the Xbox One, PS4 and PC versions that are being developed? Will the Switch version run at 1080p docked/ 720p portable at 60FPS, like previously hoped? Masaki Furusawa: From a visual aspect, its performance will be lower than the PS4 and Xbox One versions. All platforms feature a maximum of 60FPS; however, having a constant rate of 60 fps would be difficult. As for resolution, it is as you commented. Miketendo64: Other than the huge line-up of characters, a unique story and some of the usual features present in Warriors Orochi 4, what other content can players expect to enjoy when playing Warriors Orochi 4? Masaki Furusawa: We are introducing the new “Magic” feature, which allows for a different type of control, with more breadth to the action and which brings out the personality of each character. Also, a 6 player 3 vs. 3 battle online mode will be introduced. It will consist of players taking each other’s bases while fighting directly against each other. 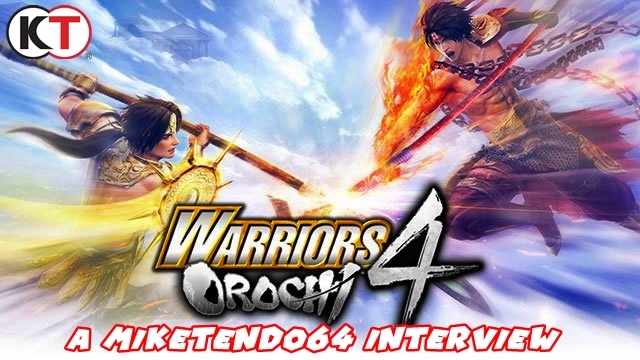 Miketendo64: Despite the sheer size of Warriors Orochi 4, there are plans to support Warriors Orochi 4, with DLC. DLC which consists of new character costumes, scenarios, divine artifacts, mounts, background music traces and a gameplay mode. What prompted the need for further additional content and can you comment at all on how often it will be distributed? Masaki Furusawa: As regularly released items, we will mainly provide content that is expected by players. Other than DLC, we plan on continually updating this title in order to allow players to enjoy it as long as possible. As for the release of new content, we plan on maintaining a pace of about one release per month. Miketendo64: Since a Switch release is planned, and the likes of Fire Emblem Warriors and Hyrule Warriors support amiibo, can Switch owners hope to use any amiibo in their possession, to earn daily gifts or is that a feature that won’t be included this time around? Masaki Furusawa: amiibos won’t be usable. Miketendo64: With a Fall 2018 release planned and development for Warriors Orochi 4 reportedly starting in 2016, the development team has been able to juggle multiple Warriors games and are producing an incredibly huge game, in no time at all. Just how large a team must you be using for Warriors Orochi 4? Miketendo64: Being as though Warriors Orochi 4, sees the return of the heroes from the Three Kingdoms and Warring States, who have forgotten the events of the third game, will Warriors Orochi 4 be the final story in the saga, or can players hope to see a Warriors Orochi 5 someday in the distant future? Masaki Furusawa: This story is set to have a closed ending in this title. There are parts we wish we could dig deeper into, and as such, it is possible for the story to be further expanded upon; however, we are not thinking about making a sequel at the moment. Miketendo64: Although this interview is about Warriors Orochi 4, I would like to ask a couple of questions about the Warriors IP in general, if I may. So, first and foremost, with the Warriors brand still going strong, what is next for Warriors after Warriors Orochi 4? Can fans hope for a sequel to a previous instalment, such as Warriors All-Stars or do you have your eyes set on making something new? Masaki Furusawa: I am afraid I cannot answer precisely. However, as the Warriors series is very important to ω-Force, the series will definitely continue to expand. Miketendo64: Given the number of IPs that you have been able to work with (The Legend of Zelda, Fire Emblem, Atelier, Beserk, One Piece and Gundam,) are there any IPs you would like to give the Warriors treatment? Masaki Furusawa: I think it is very important for us that the core fans of the IP we are working with are satisfied with these adaptations. As for my personal point of view, I think it would be very interesting to do a collaboration title with the “SaGa” series, but that’s probably just because I am a “SaGa” fan. Miketendo64: Speaking as a gamer, 3 franchises I would like to see get the Warriors treatment is Ys, Xeno and Nights of Azure. Spanning across 31 years, Ys is a franchise that has many memorable characters, a lot of history to draw from and would fit the genre nicely. A similar thing can be said about Xenoblade, Xenogears and Xenosaga. Whereas Nights of Azure may be a younger series, it’s still an enjoyable series that would suit the Warriors brand well. So, my question is, is a Ys, Nights of Azure Xeno Warriors something you can see yourself trying to pursue one day or something you have tried to do in the past? Masaki Furusawa: Again, as a personal opinion, I think that there would be potential for the “Ys” and “Xeno” series to be adapted, because, just as you mentioned, they feature characters having a strong impact, and would therefore, meld well with the Warriors series. As for “Nights of Azure”, it is an in-house IP, meaning it would be very simple to get this project on track if such a plan was to be adopted. However, as “Nights of Azure” already has a high level of action, I think that its evolution from there may be different than adapting it into a Warriors title. Miketendo64: This is something you might not be able to comment on, but is there any truth to the rumour that Hyrule Warrior’s Lana, was meant to appear in Fire Emblem Warriors and any and all Warriors game you make, based on a Nintendo IP? Masaki Furusawa: I never heard about this. It’s true that Lana is an original character to “Hyrule Warriors”, but I’m not sure it would be such a good idea to have her appear in every title. Anyway, wasn’t it just a rumour? Miketendo64: This is something else you might not be able to comment on, but in 2016, it was reported you approached Nintendo regarding a Star Fox Warriors game, which was turned down in the planning stage. Is there any truth to this particular story? Masaki Furusawa: I don’t know at all (laughs). Only a very limited number of people are aware of such conversations, so even if it was true, I probably wouldn’t hear about it. Miketendo64: Being a series that dates back to 1997, this year Warriors Orochi will be receiving its fourth instalment. What is it like to be involved with a series that has spanned across three decades and are you happy with how the series has grown? Masaki Furusawa: As the Warriors series has long lasting fans, we are developing this title with our main goal being to fulfil the expectations of such fans. The Warriors series has always been evolving from such expectations, and perhaps now we are at an important turning point. Miketendo64: Having survived as a franchise for so long (21 years,) what is it about Warriors games that you feel appeals to your audiences the most? And how are you finding the act of keeping the franchise relevant? Is it still easy to come up with ideas for Warriors games, or has it started to get harder now? Masaki Furusawa: The most important appeal of the Warriors franchise is its “exhilarating” aspect. We of course, treat each title in the series with much care in regards to the series’ concept, and when we have a decision to make, we ask ourselves “which feels the best?” as a standard guideline. In that sense, this concept is very consistent. Because this exhilarating aspect is essential for the Warriors titles to have, we have to think about what other aspects we can change to every new title in order to bring more fun to the player: a question which is always difficult to find an answer to. Miketendo64: Looking back on franchise, are there any highs and lows in the development of making Warriors games that you wish to share with ourselves and our readers? Masaki Furusawa: If I was to raise one point, I would say that having a lot of enemy soldiers appearing on screen and sending them in all directions by attacking them is on one hand, the most successful aspect of the series, but also its utmost technical difficulty. Indeed, the “exhilarating” factor I mentioned earlier is very dependent on the success of this aspect, which can be difficult to visually uphold along with hardware differences. Miketendo64: Thank you greatly, for taking the time to answer our questions. You have been fantastic. Is there anything you would like to say to the supporters and fans of the Warriors franchise? Masaki Furusawa: The Warriors series newest entry, “Warriors Orochi 4”, is going to be a favourite both for fans of the genre, as well as for players seeking an exhilarating and satisfying action game. With 170 characters each having different move-sets, I am sure every player will be able to find a character they like and also enjoy a high-tension action gameplay level never seen before in the series, so please look forward to it. Once again, we’d like to take this moment to just thank Nathan Mills from Koei Tecmo Europe, for his assistance with arranging this interview and translating it. We’d also like to thank Furusawa-san for his participation!